Copenhagenize.com - Bicycle Urbanism by Design: Barcelona Bicycles? Rent? Borrow? I'm off on holidays on Tuesday. The kids and I are off to Barcelona for ten days or so. Nope, that's not us in the photo, above, but we'll be looking a lot like that in a couple of days. Any of our readers know where we can rent decent bicycles? We'll need one for me and my daughter - so a child's seat is required - and a smaller bike for my nine year old son. I don't fancy the standard tourist rentals. Maybe there is another option that you all know about? We'll do as the locals do, of course, although the example in the above photo is not a practical solution in the long run for getting to and from the beach each day, as well as riding around the city. Something like this for Daddy-o and SuperGirl. And the kid's bike, too. In a perfect world a Bullitt or another cargo bike would be great. I like cities and holidaying in cities. I was a bit late in arranging a holiday this year but I had Barcelona, Bordeaux, Montreal and Paris in mind. I was turned on to the HomeExchange.com website by a friend here in Copenhagen who uses it regularly. I can certainly recommend it. If you don't know it already, it hooks people up for home swapping. You borrow someone's home in another city and they stay in yours during the same period. No nasty hotel bills and a great way to see a city from a local perspective. With all that said, we'll be staying at a friend's flat in Gracia but there were many great swaps between Copenhagen and the other cities. I have a list of cities that I fancy, of course, but planning a holiday with the kids I realised that I was looking for cities that are bicycle-friendly. Some other cities were on the list, but when I realised that there was little bicycle infrastructure there, they got bumped off the list. 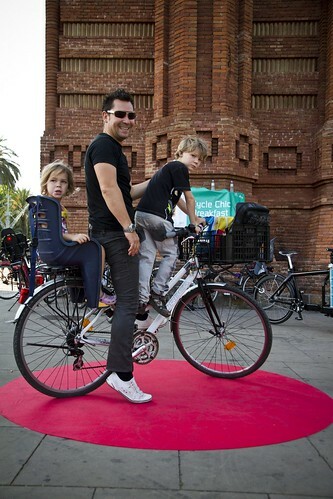 I want to be able to ride with my son and daughter on safe bike lanes. 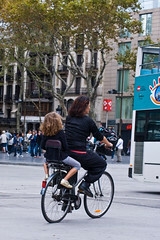 It ended up being Barcelona because of the beaches and liveableness of the place, but certainly also because of the public transport and the bike infrastructure and many 30 km/h zones. I've been to Barcelona a number of times over the past couple of years but I'm looking forward to embedding me and the kids in the city and experiencing the liveableness first hand. What makes the city and the neighbourhoods so lovely? We're going to find out. Looking forward to hooking up with friends in the city as well.